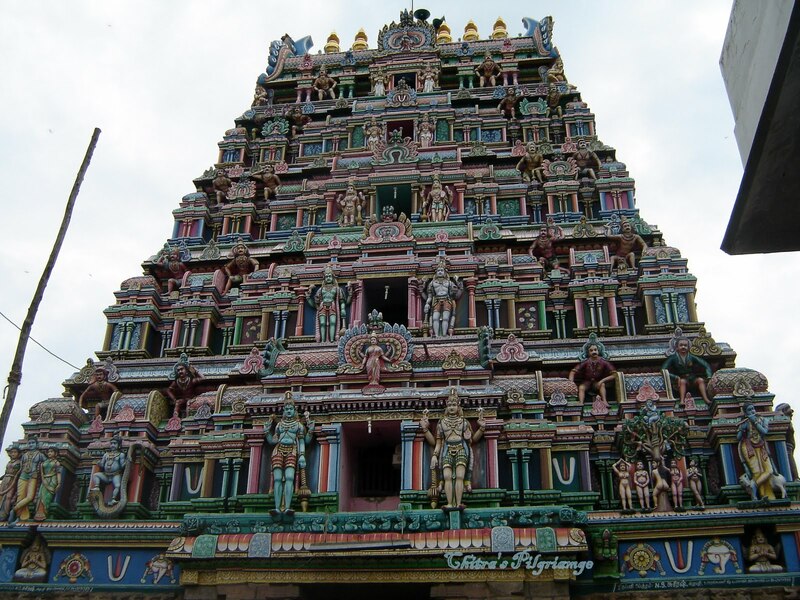 Thiruvinnagar Sri Oppiliappan Perumal Temple is one of 108 Divya Desams of Lord Vishnu located in Thirunageswaram which is 7km south of Kumbakonam in the district of Thanjavur, Tamil Nadu. 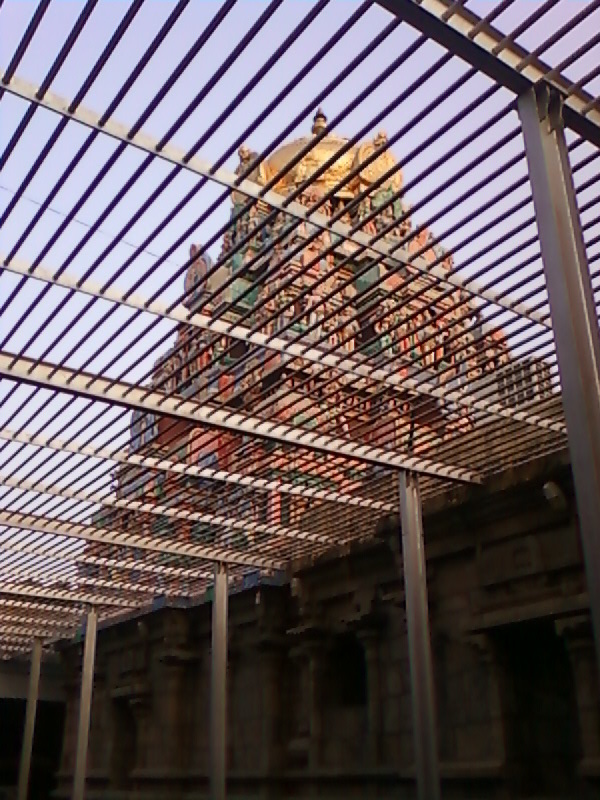 This temple is also known as Markandeya Kshetram/ Tulasivanam. Presiding deity – Moolavar Oppiliappan with his consort Bhoomidevi Nachiyar. 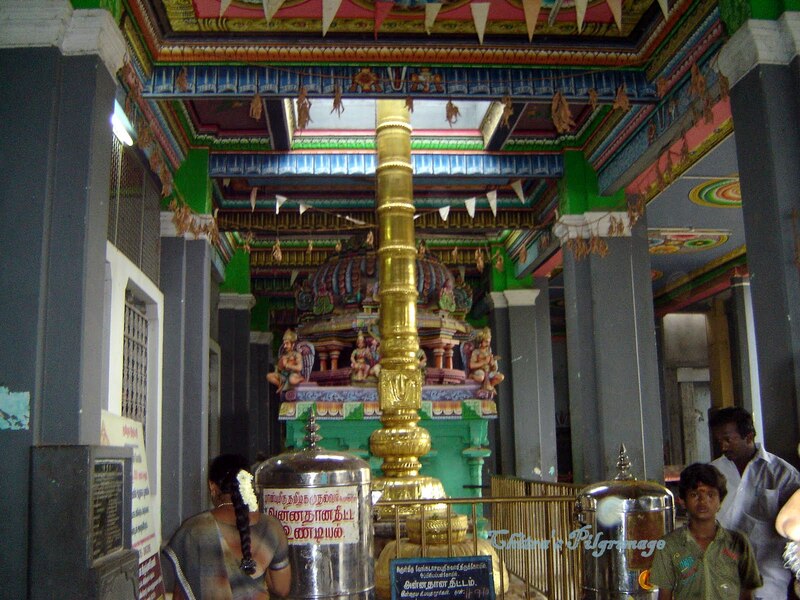 In this temple Sri Oppiliappan worshipped in his five forms as Ponnappan, Maniappan, Muthappan, Vinnagarappan and Ennappan. Bhoomadevi is the daughter of Muni Markandeya. Very young in age. The Muni was in search of a bridegroom for her. The Lord came to him in the guise of an aged man and sought Bhoomadevi’s hands. Markandeya pointed out his age to him but the Lord (old man) insisted his demand. The Rishi said that his daughter did not know even how to cook and the salt may go more or less which may cause anger against his daughter. Then the Rishi prayed to the Lord to relieve him from the confusion. A voice from the sky came, “let your daughter cook without food and that would suffice to me. Are you now ready to give your daughter to me”. The Muni understood that the caller was none other than the Lord himself… Markandeya gave his daughter Bhumadevi to the Lord in the wedding that followed. This is the shrine, where the Lord began his life with Bhumadevi. The Sthalapuraanam of this temple is discussed in the Brahmanda Purana, one of the eighteen Mahapuranas. The legend associated with the temple is as follows; Once Tulasi did penance and asked of the Lord Vishnu, "You are bearing Lakshmi alone in your chest; I request such special blessing and attention for me also" to which the Lord replied "Lakshmi occupied my chest after severe penance and now she is about to incarnate on the banks of River Kaveri in bhoologam (Earth) with the name of Bhumi Devi. You may appear there prior to her as a tulasi plant and she will incarnate in your lap (i.e. under your shadow). "I will accept Lakshmi some days later" and since you were the support or "aathaaram" for her incarnation you will be rewarded as being very special to me in this temple; more than Lakshmi. One can attain the blessings of Lakshmi only after severe penance, but one who worships me with your ithaz (leaves), will get the effect of doing Ashvamedha yagam and those who dwell in your vanam as their place of living will surely attain moksham. You will always be the garland that is presented to me. I will accept the thulasi maalai first and will marry Lakshmi only after that". On hearing this Tulasi appeared in Thiruvinnagaram. This is confirmed by the 53rd paasuram of Sri Nammazhwaar in Thiruviruththam. Later, Mrikandu Maharishi's son, Markandeya worshipped the Lord Vishnu and desired for the boon that Lakshmi should appear as his daughter and the Lord himself should become his son-in-law. One day, when Markandeya was doing Theerththaadanam and Shethra yaaththirai, after reaching Thiruvinnagaram, he felt that this was the right place for getting his desire fulfilled. Markandeya then started a severe penance for 1000 years seeking Lakshmi's blessings. After thousand years of severe penance, Lakshmi appeared as a baby under the already incarnated tulasi plant (tulasi chedi). Markandeya felt the presence of Lakshmi as the incarnation in the form of the baby and realised that a part of his desire had been fulfilled. He took possession of the baby and raised her. When this young girl reached adolescent age or paruvam, one day on the panguni month of Sravana Nakshathram, the Lord appeared as an old man and asked for the hand of Markandeya's daughter in marriage. Markandeya replied that, "You are very ripe and old, my daughter is too young and she does not even know how to cook with proper salt (lavanam) contents. You may get angry and curse her if she does not cook properly. This is not fair. You are bodily old but mentally very aware. You must forgive me and bless me but this will not work out." To which the old man replied, "If your daughter must cook without salt, then I will still take it as my best food, but I will not leave from here without marrying her." Without knowing what to do, Markandeya sought the help of the ever protecting Lord Vishnu. It was then that he realised using his thapobalam, that the old man was none other than Lord Vishnu himself. When he opened his eyes the Lord appeared in front of him with conch and chakram as in Sri Vaikundam. Markandeya asked for forgiveness and offered his daughter's hand in marriage and performed the kannikaathaanam of his daughter (Lakshmi) to the Lord. Since the Lord had said "I will accept the food that is not salted as my best and most desired food", this temple Neyvethiyam is always done without salt in any food. No one should ever take anything that contains salt into this temple and the puraanaas indicate that such persons who knowingly do so are believed to suffer in hell. The name Oppiliappan is as result of this legend. However, Nammaazhwaar called him "Thannoppaarillappan", that is he who has no comparison (i.e. there is neither an equivalent nor superior to the Lord - mikaiyum oppum illaathavan). There is also a story behind the tank in this temple. Once a King had consummated (punarchchi) with a daughter of a saint and hence the saint cursed him to become a bird. The King lived as a bird and one night when there was a storm and the branch of the tree the bird was sleeping on broke and fell into the water of this tank. The bird which got dipped by this accident in the tank regained its original form as the King and since then this is known as the only theerththam that one can do theerth thaadanam even in the night. In general "theerthAdanam " in the night is not recommended by our scriptures. 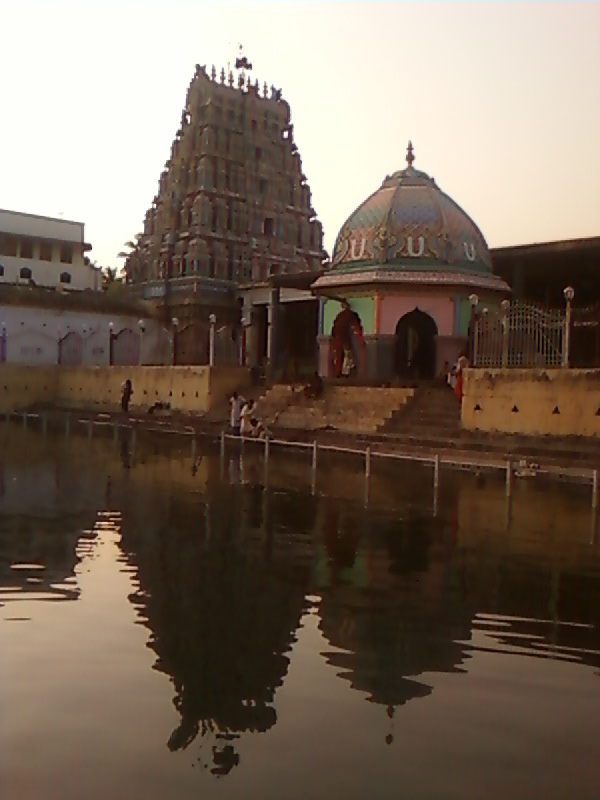 Since this tank has such a healing power in the day as well as night, it is called "ahoraathra pushkarani". Vishnu Vimaanam - Sudhanandha Vimaanam. It is named as Suddhananda, meaning "pure happiness" . Devotees who worship this vimana(tower) derive immence and unalloyed happiness. Note that the vimana in Tirumala Tirupati is named as Ananda vimana, whereas here it is Suddhananda Vimana. All food offerings at the temple are strictly and completely saltless. Salt or any food item containing salt is not allowed in the temple beyond Garuda’s Sannidhi. It is customary to offer a mixture of salt and pepper to the footprints in front of the Garuda and by doing this it is believed that such worshippers get releif from all kinds of skin ailments. It is a sin to carry salt inside the temple. Hence the Lord is also called as ‘Lavana Varjita Venkatesa’ i.e. Venkatesa who avoids salt. Pujas and festivals are conducted in the temple according to Vaikhanasa Agama sastras. Pujas are performed six times daily, starting with Viswarupa Darsanam in the morning when recitation of Suprabhatam, Prapatti and Mangalam specially composed in praise of this deity takes place. Tiruppavai recitation and Vedaparayanam then follow, concluding with Sathumurai. Then the principal Puja takes place, when offerings are made at all other shrines also. Then at noon another Puja is performed. Again the evening Puja is held, when recitation of Divya Prabandha and Veda Parayana takes place, followed by Sathumurai. Then about 8.00p.m. Principal night Puja is performed when offerings are made at all other shrines also. Then the last Puja for the day is performed about 9 p.m., following which the temple is closed for the day. This temple remains open from 6.00AM to 1.00PM in the morning and 4.00PM to 9.00PM in the evenings. It is mentioned that the temple is about 1000 years old. As per historic evidence this temple was visited by alwars who lived between 5th and century AD. Therefore this temple must be more than 1000 years. Going by Alwars managalasasanam the age of the temple must be more than 1500 years old.